Pointy things - but where's the damn tin foil? plus computer-aided design and manufacturing methodology expertise. There's executive vice president Locke Tiffin Highleyman. He adds eleven years in mechanical & electrical engineering and software development education. There's David Roberts, previously with Lucent and Lockheed Martin Control Systems. He specializes in processing and properties of metals, polymeric and ceramic materials, mechanical materials behavior and failure analysis of engineering materials. There's Todd Zimmer with prior stints at Sargent, Afcon and Exxon. He handles static and dynamic mechanical systems analysis, thermodynamics, CAD design and CNC development. There's Peter Israelson, graduate of AMU Technical University in Hedemora/Sweden. He spent 15 years designing and engineering state-of-the-art amplification. Among the engineering and technical advisors are four-time patent holder Dr. Wilbur Highleyman of Brooklyn's Polytechnic institute, MIT and Rensselaer Polytechnic. Company president Robert C. Maicks counts twenty-nine years of experience in audio engineering, concert production, marketing and consumer retail operations under his dapper belt. Tom Lyons is the in-house analog specialist and while David Cazden has since moved on, his original driver selection and crossover design for the Caravelle remain unchanged to the present. This clearly is a serious buncha folks. They're also exceedingly conservative with product introductions. 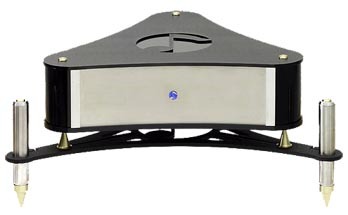 The prototype HP-110 V2 monoblocks date back to 1997 when 100 rectangular chassis Harmonic Precision amplifiers were sold into the market place, combining original circuit design with about 50% of the company's mechanical grounding technologies. In their own words, "this effort was to determine circuit life expectancy and to troubleshoot any unknowns. In the brief life span of this design, we accomplished a discovery that has led us onto the next level." Brent Riehl spent the next four years modifying the amplifier chassis to distill advances in Star Sound's Live-Vibe applications. 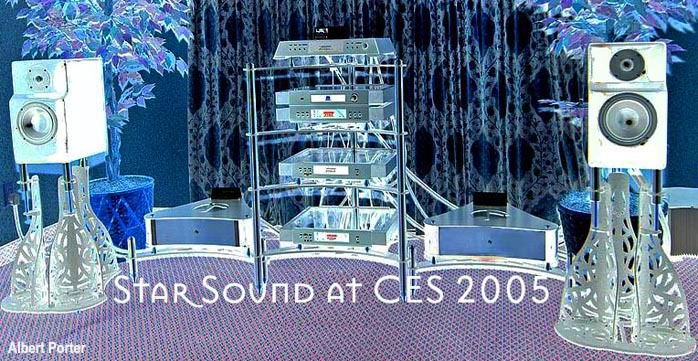 In October 2001, 20 triangular chassis amps [left] with identical circuitry but far more advanced mechanical grounding solutions sold and owner feedback was used to drive the project near completion These amps were shown at RMAF 2004 and CES 2005 but still aren't in final production. And the Caravelle speaker under review has been under development for 10 years. This clearly is a patient and very deliberate buncha folks. The previous paragraphs should have given something else away. When it comes to electronics and speakers, the Star Sound people consider circuitry just one part of the recipe. Their specialty and main focus is the marriage of circuitry and mechanical engineering. Research into materials resonances has them convinced that a major shortcoming of existing product packaging lies in the mostly rectangular boxes made from aluminum, steel, wood, MDF and various composites whose mother- or crossover boards are designed in isolation and purely from an electronics perspective. How those active electronic circuits actually behave once mounted inside their eventual enclosures is left to chance and little considered if at all. around the same basic idea. In order to wick away unwanted vibrations, you need to couple them to another device that is free to vibrate unimpeded. The more excitable this external device, the more efficiently and quickly it transfers and then dissipates the input vibrational energies. Star Sound relies on fractal geometries to break up resonance patterns into uneven aspects for rapid attenuation. Accordingly, the very elaborate stand of the 2-way Caravelles becomes an integral performance part of the final package. Cold-rolled steel sheets of proprietary formulation are scooped and filigreed such that they respond to and vibrate at specific frequencies. Those are readily felt while touching the stand during play. It's as though multiple tuning forks were resonating at very fast and high frequencies. Different leaves and portions of the stand clearly emit different -- though completely inaudible -- "tones". The stand is thus a fully active part of the Caravelle and mandatory to have the speakers perform as intended. According to Star Sound, an acoustically inert stand merely raises the mechanical resistance of Coulombs friction at the materials interface to become a far less effective surrogate tuning fork. Unlike the damping credo of the high-mass religion, the Star Sound mantra is "if it wants to vibrate, let it vibrate because it will regardless of what you do. The most expedient solution is to simply shift the locale of this occurrence to a place where it doesn't do audible damage." By implication, they believe that inherent in the diverse damping approaches of audio is an audible reduction of both musical dynamics and unhindered propagation of subtle harmonics. Their approach supposedly liberates those same dynamics and harmonics. Hence their term Live-Vibe to differentiate the Star Sound method in the audiophile marketplace. Where the Caravelle's stand is concerned, this principle becomes rather complex in execution [see below from Albert Porter's extensive audiogoN CES 2005 coverage]. In fact, it's the manufacturing complexity of this very stand that's delayed delivery of my review loaner. The speakers themselves have been happily pounded at the factory all along to surely be fully preconditioned by now. Fortunately, Star Sound just took receipt of the requisite stand materials. This eagerly anticipated review should thus commence in earnest any week now. As the CES photos show, the stand is truly an elaborate piece of work, with an equally deliberate bolt interface that secures the Caravelle atop. I understand that minor refinements to this interface will show up on the final production review sample and close-up shots will reveal the exact wheres-and-hows. Like our Product Of The Year, Anthony Gallo's revolutionary Reference 3, the Caravelle is a true 1st-order series design but here set into a hybrid transmission line/ported enclosure. The internal hookup wire is Star Sound's own Sonoran which employs a micro-bearing steel shield similar to JPS' Aluminata power cord. The same micro-bearing conductive steel finds itself embedded in the rear baffle which is exposed to the brunt of the retrograde driver energy captured by the cast granite polymer enclosure to create formidable internal sound pressures despite the 2" diameter port. Again like with the Gallos, a massive thru-bolt pulls the woofer basket into the front baffle but in the Caravelle's case, this bolt actually terminates on the outside in a hex nut. It allows the end user to slightly alter its torque. This applies more or less compression tension on the enclosure. Star Sound refers to this as "adjustable harmonic control". Conceptually, it recalls Michael Green's tensionable speaker cabinets and clamp racks. impedance as 7 ohms and efficiency as 89dB. 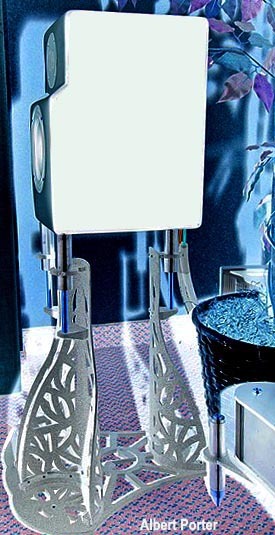 Dimensions are 9.5" W x 13" x 16.5" H, with 50 lbs per speaker and an additional 50 lbs per Sistrum stand. How it will sound in Taos remains to be seen but I don't mind telling you that based on the Caravelle's showing in both Denver and Las Vegas, I'm truly itching. From a conceptual standpoint, I must admit that the Live-Vibe concept makes a lot of sense. The multiple-degrees-of-motion approach of the roller bearings seems sensible too but haven't you secretly wondered whether the weight inertia of regular components or speakers atop such devices doesn't mean that in practice, actual micro motion of the components is completely frozen? After all, have you ever seen a heavy amplifier shimmy atop a ball bearing? If not, doesn't this beg the question whether any effective counter motion to the amp's vibrational input really occurs? If not, is that approach effective in practice? 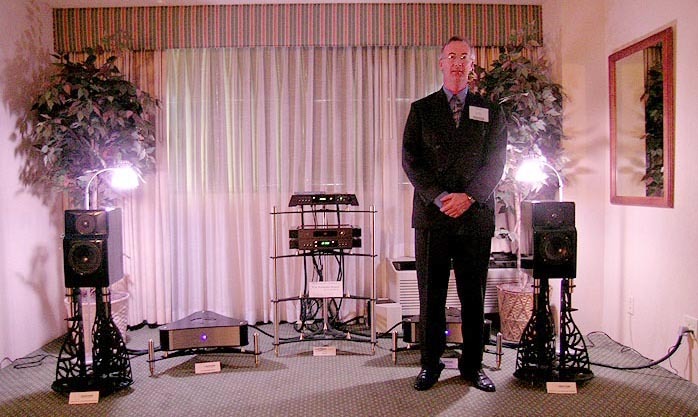 I can tell you from having held the Caravelle's Sistrum stand at the shows that it clearly vibrates very actively the moment the music starts [Brent Riehl in Denver, below]. 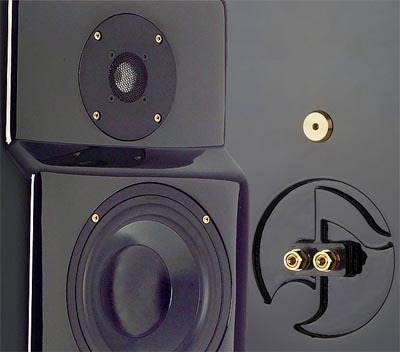 Grand Prix Audio's Monaco stands work like a wicked charm in my residence yet are based on optimized self-damping rather than gushing self-ringing. How to reconcile such dastardly opposition? If one works, isn't the other dead wrong by definition? In instances like these, I simply remember my own marketing past and grin. Then, it's all about setting concepts and preconceptions aside. It's about reporting on how well I think it works. Compare it to other examples I'm familiar with in the same genre. This will bring us to the audible impressions just as soon as the Caravelles have landed in Arroyo Seco and certain prior commitments cleared off the decks. 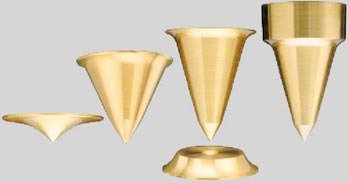 Incidentally, the Sistrum stands are said to require break-in. Before you laugh this off as yet another silly audiophile myth, remember that cutting open a long-played French horn will reveal discolorations on the lacquered brass alloy inside. Those discolorations coincide with the nodes of specific wavelengths. Both my brother and sister play French horn in a German symphony and opera, respectively. A new mouth piece sounds nothing like one that's been played. Ditto for any brand-new clarinet I ever played or the endless reeds we'd burn through. Musical instruments definitely break in and change how they sound. Since the Sistrum stand is deliberately designed to resonate freely just like a musical instrument does, this break-in "node forming" in conductive metal sounds perfectly plausible to me.